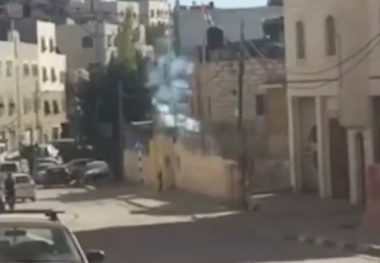 Israeli soldiers attacked, Sunday, schoolchildren while standing in line before the beginning of the school day in Hebron Elementary School, in Hebron city, in the southern part of the occupied West Bank, causing dozens to suffer the effects of teargas inhalation. Adnan Da’na, the principal of the school, told the WAFA Palestinian News Agency that the soldiers fired a barrage of gas bombs into the school’s yard, as the students were standing in line ahead of the start of their school day. He added that dozens of schoolchildren, and several teachers, suffered the effects of teargas inhalation, while some of them were rushed to al-Mohtaseb Hospital in the city, due to the severe effects that made them unable to breathe. The attack is part of repeated Israeli violations targeting schoolchildren, and educational facilities in Hebron, and in several parts of the occupied West Bank.